Working as Probationary Officer at any Public Sector Undertaking (PSU) bank like SBI, Canara Bank, BOB or others in India is prestigious job. It opens vistas for secure future for family and yourself. So, finding job as PO is a very complex process. You need to successfully pass the IBPS PO exam to qualify for the job. State Bank of India conducts its own exams to recruit Probationary officers. This is because of vast difference in salaries and perks drawn by POs of SBI over other banks. SBI POs are entitled to higher salaries and perks. Over two million women and men study and appear for the IBPS PO examination in 2018. In stark contrast, there were only 3562 vacancies for POs at 20 PSU banks in India in 2018. State Bank of India conducts its own exams for recruiting Probationary Officers. Being the largest public sector lender bank in India, SBI POs have to possess some additional skills and may be posted in remote corners of the country, where SBI branches are located. In 2018, nearly 975,000 aspirants appeared for the SBI PO exam for about 2000 vacancies. As I explain earlier, higher salaries and perks paid by SBI attract more candidates to work as SBI POs. Salaries of IBPS POs vary according to locations. Meaning, it depends on where a bank posts you: Tier-I, Tie-II or Tier-III cities, towns, semi-urban areas and rural branches. Further, salaries of bank POs are revised upwards according to Bipartite Settlement reached annually between Indian Banks’ Association (IBA), United Forum of Banks’ Unions and Ministry of Finance. Currently, IBPS POs are paid according to the 10th Bipartite Agreement between IBA, UFBU and Ministry of Finance. IBPS POs get variable housing allowance depending on area of posting. This is decided by the type of location: Tire-I city, Tier-II or Tire-III city, town or village. Your HRA allowance is calculated on the amount of basic salary. This means, a posting in metro (Tier-I) cities attracts nine percent of basic salary as HRA while for other areas, it is eight percent and seven percent of your basic salary every month. With effect from January 1, 2016, IBPS Probationary Officers are entitled to SA or Special Allowance every month. This is pegged at 7.75 percent according to the latest revision under 10th Bipartite Settlement. City Compensatory Allowance is paid to IBPS POs posted in mega cities and other metros. Under the 10th Bipartite Agreement, it ranges between three and four percent of basic salary. CCA depends upon the category of city- Tier-I. Tier-II or Tier-III. However, there are various complex parameters to calculate CCA. In some instances, you may not be entitled to any CCA. You are entitled to several other perks as IBPS PO working for a PSU bank. When added up, total remuneration of a freshly recruited IBPS PO adds to about Rs,31.000 per month. In September 2018, a meeting between IBA, UFBA and Ministry of Finance officials was held to arrive at agreement regarding pay structure revision and implementation of the 11th Bipartite Agreement. It is expected to go into force from November 1, 2018. However, details about the 11thBipartite Agreement are yet to be finalized for publication by concerned parties. Once 11th Bipartite Agreement is implemented, IBPS POs are projected to get higher salaries and perks. Basic Salary for newly recruited IBPS POs is expected to rise to Rs.37,541 per month. This will cause corresponding increase in Housing and Rent Allowance, City Compensatory Allowance (CCA) and Special Allowance (SA). State Bank of India conducts own entrance exams for recruiting Probationary Officers. It is singularly the toughest bank recruitment exam in India. The reasons are obvious: perks are higher. 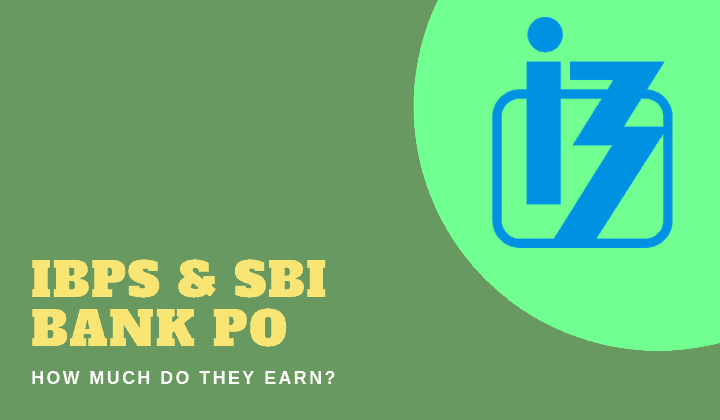 While there is not much difference in basic salaries of IBPS POs and SBI POs, here is how ones employed with State Bank of India earn much more. SBI pays maximum HRA of 10 percent of basic salary per month, to POs posted in Tier-I cities. HRA paid to employees in Tier-II and Tier-II cities and rural areas range between nine percent for other cities and 7.5 percent per month, of basic salary for rural areas. SBI pays City Compensatory Allowance or CCA of five percent to minimum four percent depending upon your location, which is marginally higher than other banks. SBI calculates CCA on basis of Cost of Living Index for your city of posting. SBI POs are entitled to myriad perks and benefits. Leave Travel Compensation: (Paid every two years of four years, depending on your choice). SBI pays for Class-II AC Tier travel on Indian Railways for employees and dependents. The bank also pays for accommodation at the destination or provides free stay at SBI owned guest houses for officers at prime locations in the city. Medical Cover: SBI covers full expenses for medical treatment of employees and maximum 75 percent for registered dependents. SBI provides cashless medical cover to employees and their dependents. Housing Finance at zero or very low interest rates for SBI sponsored dwelling projects. Vehicle Finance at zero or very low interest rates, depending upon make and cost. The Cost to Company (CTC) for an SBI PO ranges between Rs.802,000 per annum to Rs.1.03 million per year. In simple words, this translates as total monthly remuneration ranging between Rs.66,000 to Rs.108,000 per year, depending upon location and number of years. Salaries of SBI POs will also increase according to figures projected above. Corresponding increases can be anticipated in perks and allowances paid to SBI POs, once the 11th Bipartite goes into force. Recommendations of the 11th Bipartite Agreement are expected to go into force from November 1, 2018. However, the revised pay scales will be implemented for IBPS POs and SBI POs, at a later date, but most likely, with retrospective effect. This means, IBPS POs and SBI POs that continue to draw salary and wages according to 10th Bipartite Agreement will get the amount not paid since November 1, 2018 at a later date, as lump sum, if implementation is delayed for any reason. Hence, IBPS POs and SBI POs can expect a financial windfall anytime soon. Working as IBPS PO or SBI PO is very prestigious as well as lucrative. Hence, entrance exams for these jobs are very tough. Other than basic salary and perks, working as bank PO has several inherent benefits. It is a guarantee of lifelong employment. They are entitled to all government holidays including those announced annually by Central and state governments. This entry was tagged Bank PO, Bank PO Jobs in India, PO Salary in India. Bookmark the permalink. ← How to Get a Government Job After Graduation?